Commito, Mike. "Pierre Pilote". The Canadian Encyclopedia, 11 September 2017, Historica Canada. https://www.thecanadianencyclopedia.ca/en/article/pierre-pilote. Accessed 21 April 2019. Joseph Albert (Pierre) Paul Pilote, hockey player (born 11 December 1931 in Kénogami, QC; died 9 September 2017 in Barrie, ON). 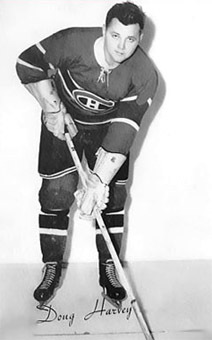 Pilote was a National Hockey League (NHL) defenceman and was regarded as one of the best blueliners from the Original Six era. He played a hard-hitting style but was also respected for his offensive prowess. Pilote won the Stanley Cup with the Chicago Blackhawks in 1961 and was awarded the James Norris Memorial Trophy three times. 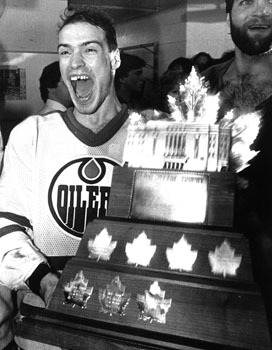 During his NHL career he scored 80 goals and tallied 418 assists and 1,251 penalty minutes during the regular season; in 86 career playoff games, he scored eight goals and 53 assists. Pierre Pilote All-Star card (1963\u201364). Courtesy Maurice Longchamps. Photograph by Kyleigh Commito. Pierre Pilote was born in Kénogami (now Saguenay), Québec, 200 km north of Québec City. He was the eldest of six children. Growing up in Kénogami, Pilote watched hockey games, but didn’t play organized hockey. After the Second World War, Pilote and his family moved to Fort Erie, Ontario. It was there that he first started playing hockey. Although he knew how to skate before arriving in Fort Erie, his first pair of skates had been his mother’s. In fact, for much of his childhood, Pilote’s passion had been baseball. It was only after being teased by local boys in Fort Erie that he finally purchased his own skates and started playing hockey. Pilote was keen to develop his hockey skills and skated whenever he could, but Fort Erie remained without an arena until 1948; the town’s only arena had collapsed during a snowstorm in 1939. Despite getting into organized hockey later than most boys (around the age of 17), Pilote soon set himself apart from his peers. In 1949, his second year of hockey, he began playing for the Niagara Falls Cataracts, a Junior-B team in the Ontario Hockey Association (OHA). The following season (1950–51), Pierre Pilote moved up from Junior-B and started playing with the St. Catharines Teepees, a Junior-A team. In 1950–51, he transitioned into playing defence and scored 26 points while racking up 230 penalty minutes (a league high). His second season with the Teepees saw him take some offensive strides, registering an impressive 53 points in 52 games. By the start of the 1952–53 season, Pilote was playing professional hockey with the Buffalo Bisons in the American Hockey League (the Bisons were affiliated with the St. Catharines Tee Pees). Pierre continued to develop a reputation as a blueliner who was tough as nails but could put the puck in the net. In his second full season (1953–54) with the Bisons, he scored 30 points and picked up 108 penalty minutes. Until September 1954, the Bisons were affiliated with the Montréal Canadiens in the National Hockey League (NHL). After cutting ties with Montréal, Buffalo operated independently until the Chicago Black Hawks (later Blackhawks) purchased them on 7 January 1955. During the 1955–56 season, Pilote split his time between Buffalo and Chicago. While with the Black Hawks, Pilote was part of a historic game against the New York Rangers on 5 January 1956. It was the first time that a hockey game was broadcast on a national American television network. Although Chicago lost 4–1, his friends in Fort Erie were thrilled they could watch him on the Buffalo station. The following year, Pilote made the jump to the NHL full-time. Pierre Pilote made an immediate impact with the Black Hawks both on the score sheet and in the penalty box. Continuing his play as an offensively gifted rearguard, Pilote was a catalyst on the power play. He was also not afraid to mix it up with other players, taking on both Maurice and Henri Richard in the same brawl during a game against the Montréal Canadiens. In Pilote’s first five full seasons with the Black Hawks, he never missed a regular season game. His streak of 376 consecutive games came to an end during the 1961–62 season after he sustained a shoulder injury. During the 1961 playoffs, Pilote’s play helped his team capture the Stanley Cup. He tied Gordie Howe for most points (15) scored in the postseason and was integral in helping Chicago end a 23-year Stanley Cup drought. Following the Black Hawks’ victory, Pilote was named captain of the team, a position he held until 1968. At the end of the 1962–63 season, Pilote won his first James Norris Memorial Trophy, the award for best all-around defenceman in the NHL. He would win the award two more times, giving him the distinction of winning it in three consecutive seasons. By this point in his career, he had firmly demonstrated that he was one of the league’s best puck-moving and offensively gifted defenceman. In the 1964–65 season, which led to his third Norris, Pilote set an NHL record for the most points (59) scored by a defenceman in a single season, surpassing Toronto’s Walter “Babe” Pratt, who tallied 57 points with the Maple Leafs during the 1943–44 season. 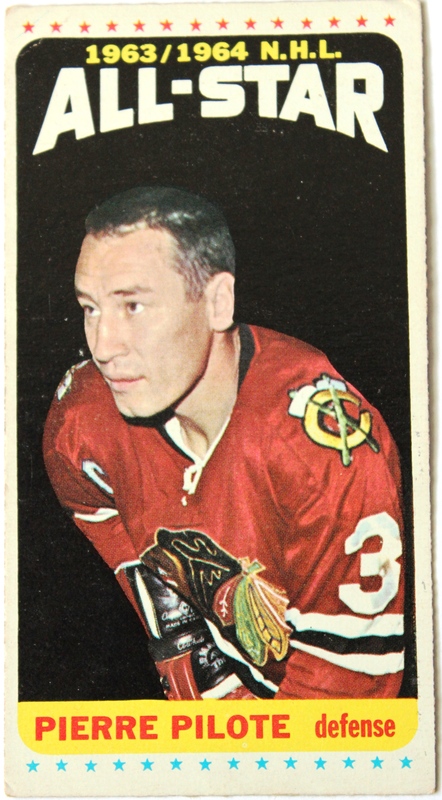 In addition to his Norris Trophy success with the Black Hawks, Pilote was also voted a First-Team All-Star for five consecutive seasons from 1963 to 1967 and played in eight NHL All-Star Games. During a game against the Pittsburgh Penguins on 13 March 1968, which Chicago won 4–3, Pierre Pilote reached the 400-assist milestone. It would be his final assist with the Chicago Black Hawks. On 23 May 1968, in a stunning move, the Black Hawks traded Pilote to the Toronto Maple Leafs for right-winger Jim Pappin. No one was more surprised by the transaction than Pilote. In his memoirs, he recalled being notified about the deal by Toronto sports reporter Red Burnett rather than by his organization. Despite his incredible success with the franchise, Chicago believed that his game was declining. Flabbergasted by how the team had handled the situation, Pilote contemplated retirement but eventually decided he was not done with hockey and reported to Toronto. Pilote played 821 regular season games with Chicago, amassing 77 goals, 400 assists, and 1,205 penalty minutes. In 82 playoff games with the Black Hawks, he scored eight times and assisted on 52 goals. As of May 2015, his 400 assists rank sixth in all-time franchise history. While initially cool to the prospect of playing in Toronto, Pilote soon embraced the opportunity to continue playing hockey with the Maple Leafs. The veteran defenceman played all but seven games for Toronto that season. However, it would be his last season in the NHL; his final game was a postseason match against the Boston Bruins on 6 April 1969, which the Leafs lost. Although Pilote retired from professional sport, he remained involved in hockey and coached his son’s minor bantam and midget teams. Pierre Pilote had always taken an interest in business, even during his days of professional hockey. While playing with Chicago, Pilote took a business administration course, and by the time he was traded to the Toronto Maple Leafs, he owned a used car business in Fort Erie, laundromats in Welland and St. Catharines, and an advertising firm in Hamilton, Ontario. After retirement, he also created his own vinyl luggage company and built up a business in Toronto that, at one time, employed 30 people. By 1986 Pierre had officially retired from business, having sold his car dealership, laundromats, advertising firm, and luggage company. In summer 1975, Pierre Pilote was inducted into the Hockey Hall of Fame. On 12 November 2008, in a joint ceremony, the Chicago Blackhawks retired the #3 jersey that had been worn by Pilote and later by Keith Magnuson. He is one of only seven players to have their sweater hanging in the rafters at the United Center. He was also inducted into the Chicagoland Sports Hall of Fame in September 2011. In a fitting hometown tribute, in January 2012 the Jonquière Sports Palace in Saguenay, Québec, unveiled a bronze statue of Pilote, which stands in the lobby of the arena. Pilote has also been featured in two Canada Post collections. The first, in 2005, was part of an NHL All-Star series. The second was a collection commemorating the country’s best defenceman from the Original Six era. It was unveiled in 2014 and also includes Bobby Orr, Harry Howell, Red Kelly, Doug Harvey, and Tim Horton. Pilote lived in Wyevale, Ontario. He had four children and 10 grandchildren. His beloved wife Annie passed away in May 2012; they were married for nearly 60 years. L. Waxy Gregoire, David M. Dupuis, and Pierre Pilote, Heart of the Blackhawks: The Pierre Pilote Story (2013).